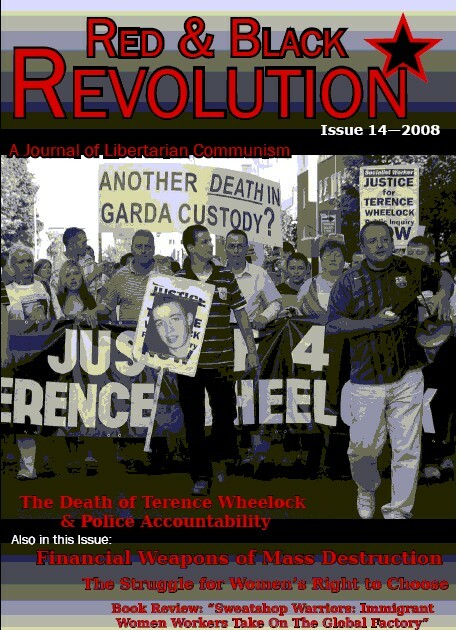 Red & Black Revolution number 6 published in the winter of 2002. Terry Clancy, of the Free Earth website, examines the 'free' press to find out why we shouldn't expect them to provide neutral or impartial coverage, especially during a war. Max Stirner was an obscure prophet of individualism living in nineteenth century Germany. many anarchists today including anarcho communists also consider themselves Stirnerists and a Stirnerist tradition lives on in places like Glasgow. Conor Mc Loughlin examines some of Stirner's ideas. Bakunin had a vision of an alternative way to run society and it is a vision that we share today. I want the replacement of the current economic system, a system based on profit and hierarchy, with a system based on need and freedom. I don't believe the current system can be reformed to make it more human. In different ways, and on various levels, the political work I do is aimed at creating the possibility of revolution. Revolutionary change is not as unusual as is often thought; in 1974 we had the Portuguese revolution, in 1979 Iranian Revolution, in 1979 Nicaragua, in the eighties we saw the collapse of the Soviet Union.